In our second-annual Future 40 ranking, a clear trend emerges: smaller companies are disclosing more. Canada’s biggest companies – those with annual revenues of more than $2 billion – are generally thought of as the best disclosers of sustainability performance, partly because they have the resources to properly track, compile and report metrics, such as carbon emissions, water consumption and management diversity. It is this information that Corporate Knights’ annual Best 50 ranking counts on. But many companies falling under that $2-billion threshold, as captured by our Future 40 Responsible Corporate Leaders in Canada ranking, are arguably taking sustainability disclosure just as seriously. More importantly, they’re showing a willingness to catch up to their larger peers. For example, year-over-year disclosure across a number of metrics – specifically, energy use, GHG emissions, water consumption, and waste generated/recycled – has improved considerably for the 83 companies that formed this year’s Future 40 short listed. Waste and water indicators showed relatively lower disclosure rates, but still big year-over-year improvements. Nearly half – 48 per cent – disclosed water consumption, compared to 39 per cent the year before; and 51 per cent reported how much waste they generated, versus 44 per cent the year earlier. Within the waste category, reporting on waste recycling also improved – to 45 per cent from 34 per cent. As the trend works its way down to smaller companies, it opens up more opportunities for socially responsible investors and their portfolios, Yow added. Signi Schneider, vice-president of corporate social responsibility at Export Development Canada (EDC), which topped this year’s Top 40 ranking, said one of the best investments her organization made was assigning and training one person who thoroughly understood the disclosure requirements of the Global Reporting Initiative, which promotes global standards for sustainability reporting. The information that makes up the Future 40 is collected from publicly traded companies that disclose their environmental, social and governance data either through CSR/sustainability reports or some other publicly accessible medium. That data is aggregated by organizations such as Bloomberg. For non-publicly traded companies, we rely on reports identified by the GRI. 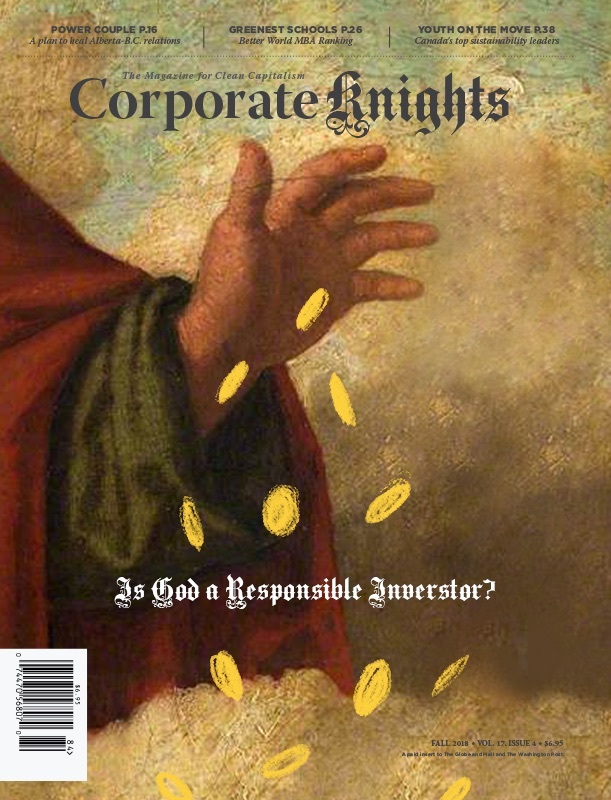 Corporate Knights considers the Future 40 as a kind of farm team that feeds future sustainability leaders into the big leagues of our Best 50 ranking. In this respect, the Future 40 offers us insights into how performance on the Best 50 might change over time. Ultimately, our aim is to get small and medium-sized companies in Canada to start asking questions that will become increasingly important to their businesses as they grow: How do we use resources? How do we assure good governance? Are we treating employees and the communities in which we operate fairly and respectfully? Answering these questions transparently, and reporting the data that supports those answers, isn’t just the future of sustainable business – it’s the future of business. Big companies = Bigger CEO pay day? The difference between Corporate Knights’ Future 40 ranking and its Best 50 ranking has to do with the size of the companies represented. To be on the Best 50, companies need to have at least $2 billion in revenues. Under that, companies fall into the Future 40. We decided this year to zero in on CEO pay relative to average worker pay. Is the gap, on average, larger in the Best 50 universe compared to the Future 40? Some industry groups simply don’t disclose this information. However, we were able to draw comparisons between six industry groups that met our disclosure threshold: energy, financials, industrials, materials, telecom services and utilities. 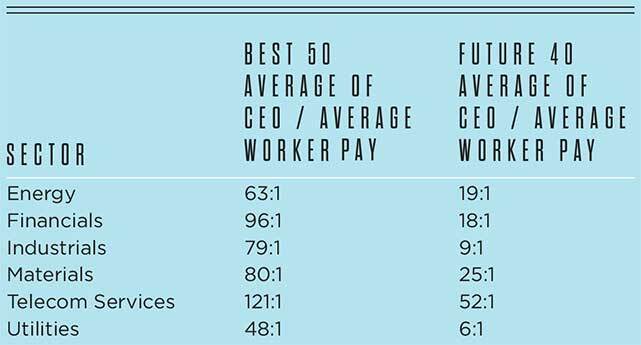 As you’ll see below, CEOs of big companies on average make substantially more than their smaller peers, when measured against average worker pay. Shocking? No surprise? Visit Facebook.com/corporateknights and tell us what you think.